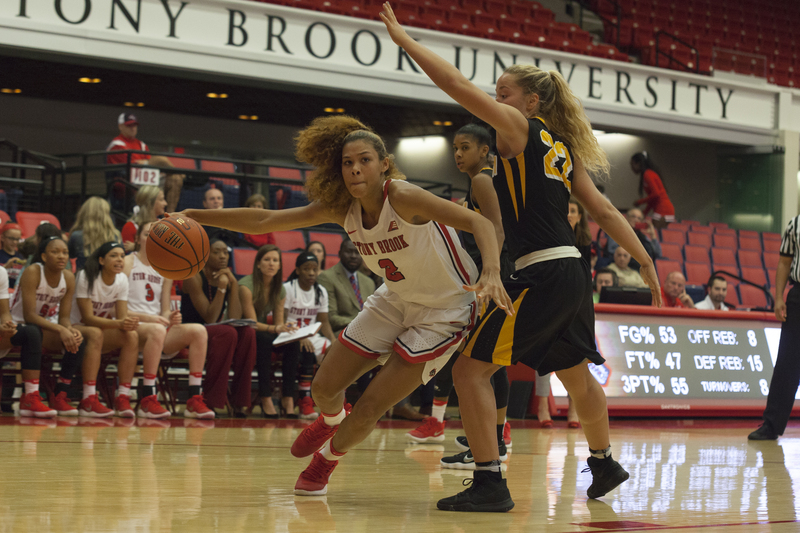 Stony Brook Women’s Basketball held its own until the final moments of Sunday afternoon’s matchup against New Hampshire at Island Federal Credit Union Arena. The Seawolves trailed for the entire second half until a pair of layups from junior guard Jerell Matthews netted the team a 50-49 lead with 2:18 left in the fourth quarter. Stony Brook battled to defend its one-point advantage, but New Hampshire senior center Carlie Pogue managed to create space inside and fire off a turnaround fadeaway with 0:02 left on the clock. Pogue’s shot found the net and sealed the Seawolves 51-50 loss to the Wildcats after a last-second heave from junior guard Shania Johnson missed the mark. After the game, head coach Caroline McCombs commended her team’s resilience in the crunch-time defeat. Stony Brook opened Sunday’s game with a solid first-quarter run, netting the team a 14-10 lead through the opening 10 minutes. Momentum swung away from the Seawolves in the second, however, when the Wildcats more than doubled their opponents’ offensive output, scoring 16 points to Stony Brook’s eight. The Seawolves’ 3-10 shooting performance in the second quarter proved to be a crucial misstep in a game that was ultimately decided by a single point. While UNH only held a one-rebound advantage over Stony Brook on the backboards, grabbing 31 total rebounds against Stony Brook’s 30, the team dominated both the offensive glass and second-chance scoring opportunities. The Wildcats turned 12 offensive rebounds into 12 second-chance points, while the Seawolves earned just two points from six offensive boards. The Seawolves outclassed the Wildcats on the interior with 32 points in the paint, 10 more than their opponents scored inside. However, UNH all but erased its interior deficit with 19 points off 18 Stony Brook turnovers, while Stony Brook converted 15 UNH turnovers into just 10 points. While the Wildcats shot 35.2 percent from the floor overall in the matchup against the Seawolves’ 44.4 percent team effort, an extra nine shot attempts and added production from their leading scorers helped put the visitors on top. UNH senior forward Kat Fogarty led all players with 18 points, while Pogue finished second overall with 17 points. Johnson, Matthews and junior forward Cheyenne Clark scored a combined 33 points, but were outmatched by Fogarty and Pogue, who combined for 35 points. Clark’s performance was a bright spot for Stony Brook in the loss. Her 11-point, seven-rebound effort put the Mohawk Valley Community College transfer just three boards away from what would have been her fourth double-double of the season. Stony Brook’s loss, which snapped a two-game win streak, drops the team’s record to 2-4 America East play and 10-9 overall. UNH’s win advances its record to 5-1 in the conference and 14-5 overall. The Seawolves will look to earn their third win in conference play on Wednesday, Jan. 24, when they take on the UMass Lowell River Hawks. Tipoff is scheduled for 7 p.m. at the Island Federal Credit Union Arena.